I love stories. I honestly live for them. The more I think about it, the more I think it's hardwired into my brain. I mentally turn my day into a kind of story whenever I wake up ("Today's the day I overcome procrastination! Or...will it be?? [see - it's a mystery!]) If I read an article, or someone starts talking to me, I can't maintain interest for more than a minute unless they've hooked me with an interesting premise. ("Were there any polar bears at your layover in Duluth, Frank? No? The 'Catch Me If You Can' guy, maybe? Work with me here.") I think we all love stories so much because they're windows into another world, another person's - living, dead, real or fictional - life. And with enough tantalizing details, it becomes an open window...that we can climb through...with our minds! It's taken me a while to write this last piece analyzing one of the best games I played in 2012, but I'm glad I wound up taking this long to do it. It gave me some time to reflect on the end of the series, which ended recently with a powerful finale up there with some of the best fiction I've encountered this year. And the coolest part? I actually got to experience it in an active role. I got to decide how Lee Everett - a man with a dark past and a chance at redemption - would behave during some very difficult moments in a horrific new world. Before I finished the game I was mentally preparing myself to be up in arms about how many of the decisions you make actually affect the storyline (something I brought up in just about all of my previous posts discussing this game). I even had a list of ideas written down to share here, with fixes that would allow for bigger branching paths next season (or in any forthcoming story-driven game). But it all feels nit-picky now, after experiencing everything the game had to offer. Even though the game's writers intervened at almost every corner to decide what happened to Lee and his companions despite whatever decisions I made, that didn't stop the fact that in the moment I felt like I was there, playing whatever small part I could to protect myself and those around me. That's really the heart of it right there. Don't you do that all the time, with any story? You naturally wonder what you would do if you were in that hypothetical situation. And you always assume you'd do the right thing, right? Or the smart thing, or the just thing. But how do you know that? You don't, is the answer. You don't actually have a hoard of zombies rushing you, with two friends screaming for help from opposite sides of the room. Sure, it may just be a video game. But that lump that forms in your throat as you realize you don't have enough time to save both of these people - two character that you've spent time getting to know, that have watched your back all game - that's real. And you don't get that from any other passive experience. I'm going to second what Justin McElroy over at Polygon has said about this game. Everyone should play it. Not just every gamer, or fan of zombie fiction. 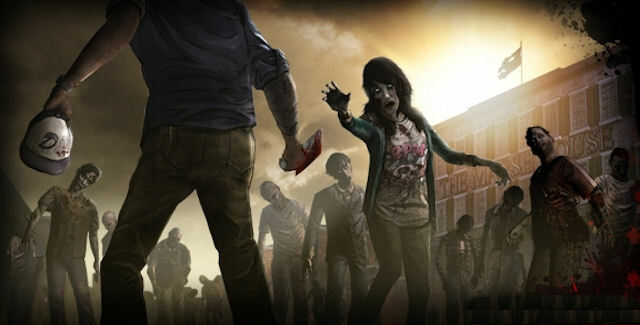 Everyone should give it a shot, because The Walking Dead is something different, something special, and it shows another side of gaming that I don't think many people are familiar with. A new level of immersion, without any stats, numbers, health bars, buttons (well, ok, technically, you've got to press some buttons) or anything to worry about besides how Lee is interacting with the world around him. I'll close by saying this: boy, did that ending make me cry. And - while I will acknowledge that it's getting to be less and less of a big deal to say this, seeing as how I've now got two other posts centered around some thing(s) that made me cry - this is actually a first for me from a video game, so I think it's still bears mentioning. And hey, when's the last time I wrote four full posts about any one game? Even my favorite game of 2011, Batman: Arkham City, only got one! I'm going to be putting out my Top 5 Gaming Moments from the past year up soon. And I've had some truly great experiences in gaming this past year. But I bet you can guess which one tops them all. PS: Ok, the next time I cry while playing a video game, I'll probably have to mention that too - if only to say that that game surpassed the bar set by The Walking Dead. Hmm. But then after that, I suppose I'd have to mention what surpassed that bar, right? Alright, look. You're just gonna have to keep hearing about all of my crying. Don't be a baby about it.